JNN 28 April 2014 Baghdad : A series of explosions killed at least 28 people and injured dozens at a Shi’ite political party’s rally in Iraq’s capital ahead of the country’s parliamentary election on Friday, police and medical sources said. 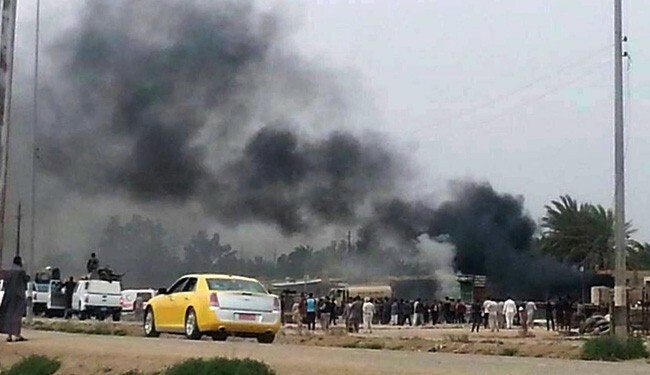 The explosions struck as some 10,000 people had gathered at the Industrial Stadium in eastern Baghdad for the Asaib Ahl al-Haq rally, in which the Shiite group planned to announce its candidates for Iraq’s parliamentary election Wednesday. An Associated Press reporter at the rally heard intense gunfire follow the blasts. Attendees fled to a nearby building under construction in the stadium complex as female parliamentary candidates screamed. Police and medical said several of the wounded were in critical condition. They spoke on condition of anonymity as they weren’t authorized to release the information. 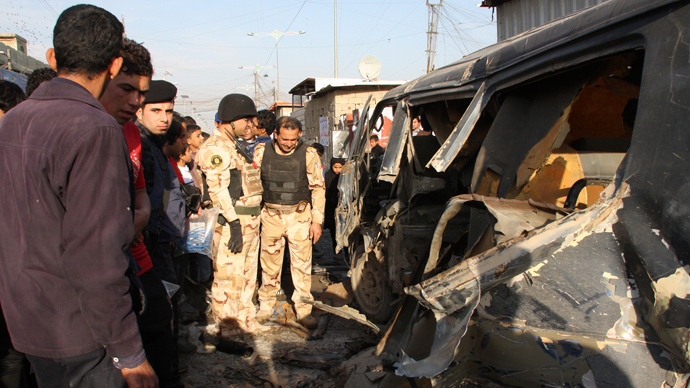 The blasts Friday are to highlight the foreign-hatched sectarian violence that’s plagued Iraq recently. Last year, the death toll in the country climbed to its highest levels since the worst of the country’s sectarian bloodletting between 2006 and 2008. The United Nations says 8,868 people were killed in 2013, and more than 1,400 people were killed in the first two months of this year alone. No one immediately claimed responsibility for the attack, though an al-Qaida spin-off group known as the Islamic State of Iraq and the Levant uses similar tactics. More than 9,000 candidates are taking part in Wednesday’s elections and will vie for 328 seats in parliament. An al-Qaida spin-off group has claimed a dual bombing at a Shiite political rally in Baghdad on Friday, according to a statement posted on militant group’s forums, just days before national elections. “Abu Aisha al-Iraqi and Abu Osama al-Iraqi… managed to enter a gathering of infidels… during their parade in Sadr City and blew up their suicide belts,” said the statement attributed to the so-called Islamic State of Iraq and the Levant (ISIL). The statement derisively referred to the group targeted, the political wing of the Asaib Ahel al-Haq (League of the Righteous) militia, as the League of the Vain. It said the attack was carried out in revenge for what pro-government militias are doing in Iraq and Sham (the Levant). Earlier Eight people were killed and 45 others injured Wednesday in a truck explosion in the northern Iraqi city of Mosul, a security source said. The truck exploded in the Shiite-predominantly Baybokht village, 20 kilometers north of Mosul, the source told Anadolu Agency. More than 20 vehicles were damaged in the blast. Iraq has seen a surge of violence in recent months, ahead of the country’s parliamentary elections on April 30. Although most attacks go unclaimed, Iraqi authorities usually point the finger at Al-Qaeda-linked militants. This entry was posted in Iraq News and tagged Baghdad, Iraq, ISIL, Islamic State of Iraq, Islamic state of Iraq Leviant, parliamentary election, Shia Martyred, Shia Political Party. Bookmark the permalink.